DIARY OF A PUBLIC SCHOOL TEACHER! : Goodbye Creativity and Imagination, Hello Common Core Writing! I was at a meeting this morning, (Yes, another one). This one was about Common Core writing standards. I sat there, staring blankly at the PowerPoint presentation being READ to me. (That's another post topic). My mind wandered to the soldiers in North Korea, all marching to the same beat, the same cadence. Not a skip, hop, or jump, no one out of place. That's what the Core reminds me of. The presenter continued, "And in 2nd grade they have to know, and in 5th grade they have to..." I wanted to ask what if they don't get it in 2nd grade, then what happens in 5th grade? But I already know the answer to that question. But what jolted me out of my state of emotional apathy was when the presenter began showing, and reading, to us the slide on what type of writing we are expected to cover in certain grades. Our presenter said, " If you notice, it's only 20% Narrative in the 5th grade. That's because in the real world, in a college and career ready world, students write using argumentative and informational essays." SCREECH!...I woke up. In the real world? Does she mean the real world where there are authors who write fiction? The real world of playwrights, screenwriters, people who create commercials? The list is endless. The number of people who have careers that use narrative writing is endless. 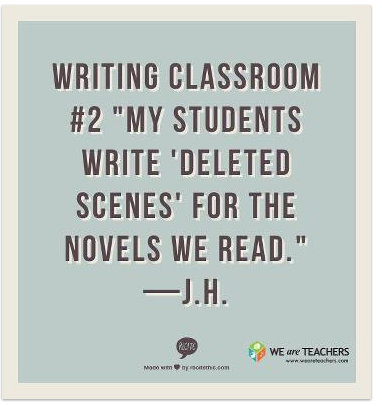 And more importantly, I can only imagine the horror of being in a classroom where only 20% of the writing is Narrative. 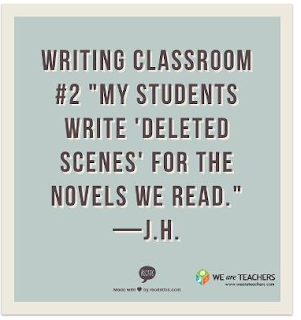 I have many students who thrive in the narrative format, and struggle horribly in others. What do I tell them, sorry we have reached our quota of narrative writing for the year? And how does one determine 20% Is there some rubric I will be forced to follow? I love the activity in the picture above. Tons of creativity and imagination are required. But I guess if I'm going to implement it next year, it better not be before I go over my 20%! So . . . I guess we have "given up the fight" to graduate life-long lovers of reading. What about all of the professional, college-educated people who read fiction? Who will create it for them? When and how will we all escape from this "real world" when we feel the need to? I enjoy reading non-fiction, but not 80% of my "reading to escape into another world" time. Far too much reality. Not enough imagination. Bad news for us all. Push ahead with your creative pursuits .... time to make 'argumentative and informational writing a creative endeavor! hello, I'm a student studying english education. This issue is one that would naturally have an impact in my classroom. I was wondering what you think could be done to better the standards of Common Core? Or do you think that there is another option entirely? I agree with you, 5th grade is far to young to impose black and white writing on children. But while the real world does include fiction writers, I would estimate that the ammount of non-fiction and business writing that is done vastly outstrips the ammount of fiction. Let's also face it: fiction can be lucrative, but only for a few. For most it's a way to scratch out a living. The worst part is many English teachers don't see the art that's present in a really good argumentative essay, or even a "dry" business memo. I take Federalist 51 as my example of the argumentative/persuasive and leave it at that. Business writing, while dry must be that way, since no two people read a metaphore the same way especially if you are in an international company. There is art to making things brief and crystal clear while filling it with all the neccessary information. But all of this is lost in school where the assignments are so regimented and boring. Research reports and essays are not the way to teach either of these two "real life" skills. Again, I agree that elementary school is far too early to impose such archaic standards on minds just learning that writing (and reading) is fun, I even think that a 20% quota is too strict for high school. By that age students need to be able to write accademically but there needs to be more balance, with 2/3 essay/accademic and 1/3 narrative/creative.